Vicky Featherstone and Lyn Gardner on the Rita, Sue and Bob Too controversy, arts philanthropist Jonathan Ruffer, and poet Sasha Dugdale on her new collection Joy. In December the Royal Court withdrew and then reinstated its invitation to stage a new touring production of Andrea Dunbar's semi-autobiographical 1982 play Rita Sue and Bob Too as a result of sexual harassment allegations made against its co-director Max Stafford Clark - himself a former Artistic Director of the Royal Court and one of the most influential theatre directors of his generation. The Royal Court's current Artistic Director Vicky Featherstone and theatre critic Lyn Gardner discuss the way in which the play continues to speak to young women today and the impact of the recent controversy on this particular production in the context of the continuing revelations about sexual harassment in the arts industries. Kirsty Lang speaks to Jonathan Ruffer, the city financier who has donated almost £200 million to fund arts and restoration projects in the town of Bishop Auckland. For the past two summers the town has hosted the open-air drama Kynren, with the participation of 100 volunteers. In October Front Row covered the opening of a new mining art museum in the town, this year sees the re-opening of Auckland castle, a new Auckland Tower visitor attraction and, in 2019, a Spanish Art Gallery and Faith Museum. Sasha Dugdale reads from her new collection, Joy. The title poem, which won the Forward Prize for the best poem published in 2016, is a monologue in the voice of Catherine Blake, as she grieves for her husband William and in doing so celebrates their close and creative life together. Dugdale is also a playwright and translator and was until last month editor of the international magazine Modern Poets in Translation. She reflects on the impact this has on her own writing. 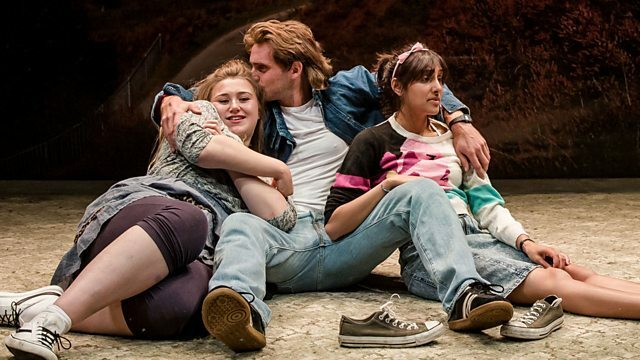 Rita, Sue and Bob Too is at The Royal Court Theatre, London until 27 January 2018, and then tours to the Lawrence Batley Theatre in Huddersfield and Theatr Clwyd in Mold. Main image above and image to the left: Gemma Dobson (Left - Sue), James Atherton (Bob) and Taj Atwal (Rita) in Rita, Sue and Bob Too. Image: Motorhead playing on Top of the Pops in 1979. Fast Eddie Clarke is on the right. Joy, Sasha Dugdale's new collection of poetry is out now in paperback and eBook formats from Carcarnet Press.